Hope for the Nations, Sunshine on Songo! The weather was kind for the annual Hope for the Nations event in Leeds this year for this multi-cultural and multi-faith event offering free entertainment in one of Leeds’ main central pedestrian precincts. Lucas, Raph and Diego taking the leads, with Demetri back in the ‘engine room’! 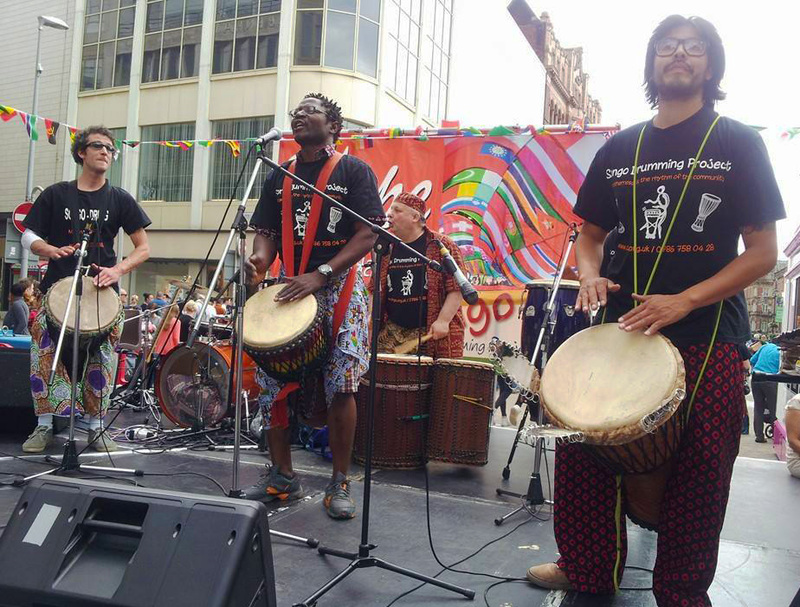 Once again, the Songo Drumming Project had the honour to be included amongst many acts and performances from around the world as well as some well known ensembles from our local area. We had presentations from Kurdistan to the Philippines and from many places in between. We marvel at how the organising team and sound engineers keep the rotation of acts so well coordinated and each band receives personalised attention to help them to give the best chance of giving the performance they wish. The audience delights at the energy of the performers and get the opportunity to learn more about faiths from around the world at the various stalls. This entry was posted in Performances and tagged community, multi-cultural, multi-faith, performance, street performance by Songo. Bookmark the permalink.